Stay Rad Wine Blog TV Episode 133: Extra! Extra! 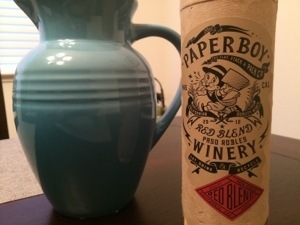 In this episode, Jeff tries a wine from a paper bottle. What’s the worst that could happen? What’s your take on wines in alternative packaging? Leave a comment, and let us know. This entry was posted on May 8, 2014 at 7:55 pm and is filed under Stay Rad Wine Blog TV, Wine. You can follow any responses to this entry through the RSS 2.0 feed. You can leave a response, or trackback from your own site. This one sounds so bad that I almost have to seek it out now! I’ve been there. I do have to say the garbage taste faded with time… Only to give way to fakey fake fruit fakeness. So, wat did you think of Paperboy? I think you should try it, Pop. Glass is 100% recyclable so why should I drink wine in plastic? Because of the extra paper cover? This was not a sample, WG. I paid my hare-earned 11 bucks for this pile of crap. That being said… Truett Hurst does make some good wines too. My wife and I were talking about the recycling thing after the fact… I don’t think there is any real advantage to this… except for the ability to bring it to a tailgate event where glass containers are prohibited.